A trip to Santorini had been on my list for the longest time. 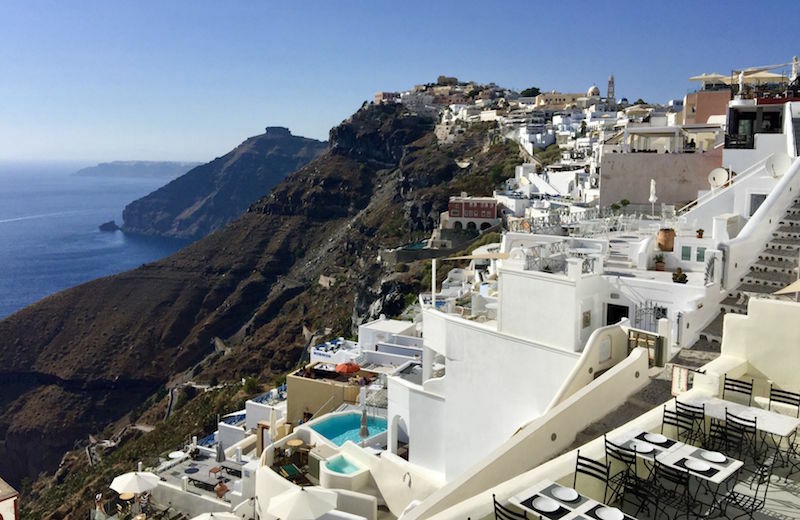 So, after having spent plenty of time on the beautiful beaches of Mykonos, my friend Sarah and I decided that we wanted to experience a change of scenery and take a day trip to Santorini. We said goodbye to our friends (who were still happily sunning themselves on the beach) and hopped on the next ferry bound for Santorini. After a two-and-a-half-hour jaunt across the Aegean we arrived in the bustling port of Santorini. The port was filled with wide-eyed tourists being greeted by hospitable locals. We were ready for our island adventure! After making our way through the crowd we descended down a set of sun-bleached stairs carved in the side of a cliff. When we reached the bottom of the stairs I was surprised to see some of the most breathtaking views and the scenic landscapes I have ever seen. When reached the entrance to our hotel, the Astarte Suites Hotel in Akrotiri, I was greeted with a refreshing glass of Greek wine, which I savored while waiting to check into our lavish suite. My stay at the Astarte Suites Hotel was truly rejuvenating. I enjoyed swimming in an extraordinary infinity pool and woke up to the roaring sounds of the ocean. 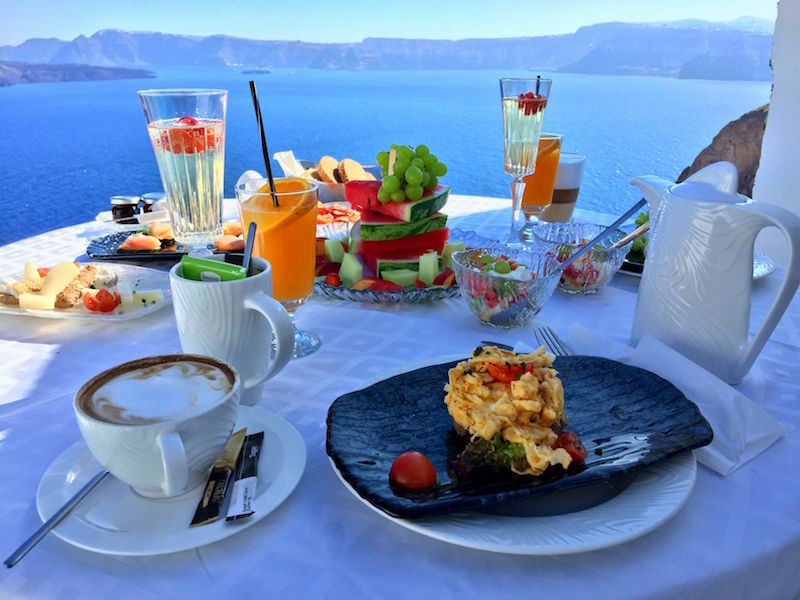 Each day I was welcomed by a pre-set breakfast table featuring my new favorite coffee: the Freddo Cappuccino, a widely popular iced coffee beverage in Greece. Although Sarah and I were looking to unwind from our routines, that didn’t stop us from hitting a few of the local bars in the area. Our most favorite out of them was the Tango Bar. Offering us the perfect spot to witness Santorini’s majestic sunset paired with nice music and delicious cocktails, we visited this spot twice during our entire stay. During my stay in Santorini, I got to visit the picturesque capital of the island: Firá (pronounced Fir-AH). At only a fifteen minute drive from my hotel, Firá was perched high on the edge of Caldera and was nothing short of an unforgettable painting. As memorable as this may sound, I actually rode a donkey up a steep cliff to Fira and spent an entire day exploring it and literally shopping my heart out. There was no way I was going to miss on witnessing the white-washed cubic buildings and the blue cupola church of Oia. During my day trip to this beautiful town, I walked down the narrow winding streets, saw the houses built for Venetian sea captains and got a taste of the typical Greek architecture. Santorini, in all its essence, offered me the much-needed time away and the perfect opportunity to relax after all the fun I had in Mykonos. It definitely lives up to its expectations for being one of the most sought after places for an ideal romantic getaway. I would love to go back to the surreal island with my man next time to enjoy the crystal-clear water while being perched on the rim of an active volcano—that too in the middle of the sea!